Monday was Polar Express day at school for my Bean. 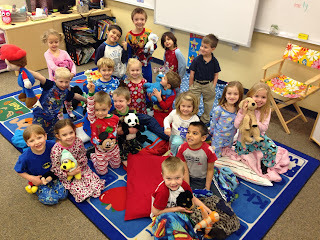 That meant she got to wear her jammies to school and take a stuffed animal to snuggle while they watched the movie. As we pulled into the drop-off line, she informed me in a voice of panic mixed with sadness that she forgot her stuffed bunny. Like everyone else in the world, I had a crazy busy week. Going home to get her bunny would add an extra 40 minutes to my morning. But I couldn't bring myself to tell her I wouldn't go get it. As I walked into the school 40+ frustrating minutes later, I ran into my aunt. She's the director (like the principal) at my girls' school. When I explained why I was there, green bunny in tow, she pointed out how kids with working moms wouldn't be so lucky. And we agreed that it made our hearts a little sad to think about. That few minutes with my aunt turned my day around. It reminded me how lucky I am to be able to do things like retrieve a forgotten bunny. And to pick my girls up each day, hearing the news and excitement from their days at school. And to be able to run every morning. 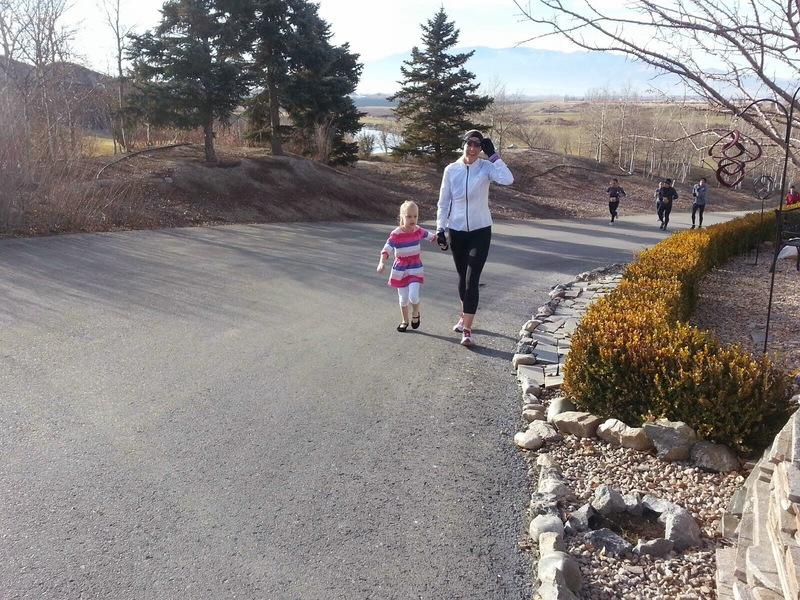 Even when I have to cut my run short because I have to wander around my house looking for a bunny. The morning was a reminder of how blessed I am. Reminders like that aren't always easy, but I wouldn't have traded it for those extra 40 minutes. After five fun-filled family days, I am a little behind on things. One of the things that was overlooked during all the fun was a reminder that the end of the Spartan Race Entry Giveaway was nearing. And is now upon us. Instead of announcing the winner, I am extending the deadline until the end of this week (Friday, Dec. 6)!! So enter now. And don't forget to watch the World Championship Spartan Race on NBC Sports this Saturday. I hope you all had perfect Thanksgiving holidays. Mine was amazing. I ran the Thankful 13 half marathon and really just ran completely for fun. I even stopped to get some love from my family. 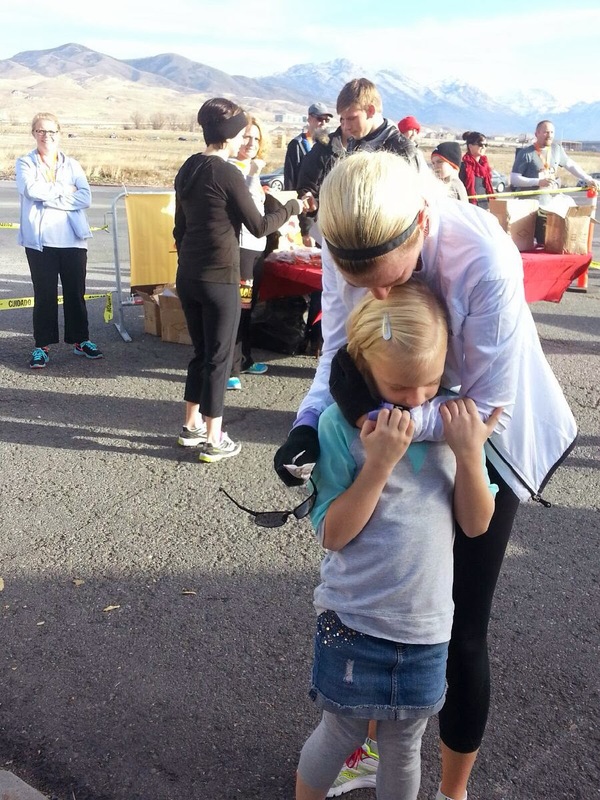 Nothing beats seeing their faces unexpectedly during the race and getting hugs at the finish. Dinner at the restaurant was yummy, even if it wasn't exactly a traditional Thanksgiving meal. And the rest of the weekend was full of family, games, goodies and a little shopping. 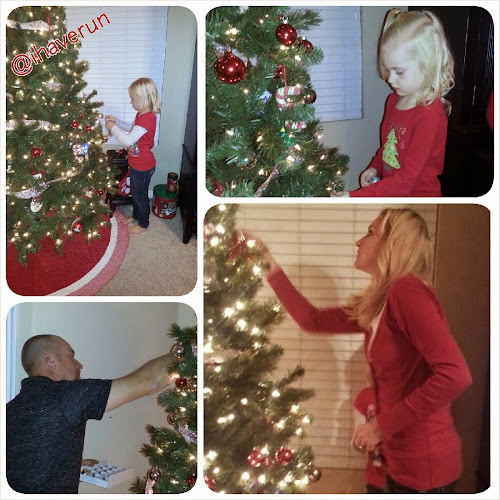 One of the weekend's highlights was putting up and decorating our tree. The rest of our house has been decorated for weeks, but we waited until the day after Thanksgiving to get our tree. Now I'm in full Christmas mode!! Counting down the days, eating all things candy cane and doing plenty of shopping.